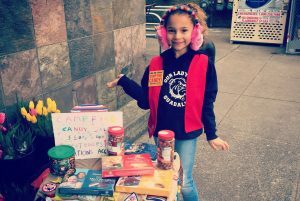 Our Candy Sellers need your support now more than ever with this weather! You can still purchase candy on our online store. To attribute an online candy purchase, a link will be available in your order confirmation email with a link to “Credit a Candy Seller Here!” – Meet some of our candy sellers on our Facebook page! The annual Candy Sale is our major fundraiser that directly benefits Camp Fire kids and programs! This year’s sale will run from Friday, January 25th – Monday, February 18th. The sale teaches youth valuable skills including goal setting, public speaking and engaging with their local community. 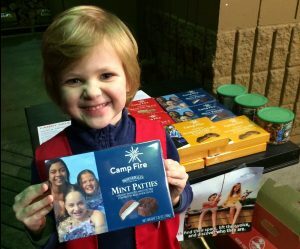 You can help Camp Fire youth reach their candy selling goals and make a difference for families in need by purchasing Camp Fire Candy this year. Purchase any of the following for just $5 per box: Creamy Smooth Mint Patties, Almond Roca, Almond Caramel Clusters, P-Nuttles, and Camper Mix. Make sure to check back often as we will be updating this map throughout the Candy Sale! If you are not able to make it to a seller location, no worries – online purchases are available and you can still give credit to a Camp Fire Group! You will find a link in your receipt. Candy can be mailed to any address in the continental United States or you can opt for a free local pick-up from our West Seattle office if you’re in the neighborhood! Not a candy fan? You can still support our sale by purchasing candy that will be donated to our troops. The USO Northwest is located on the flight-line at McChord Field at Joint Base Lewis-McChord serving troops that are deploying for missions. 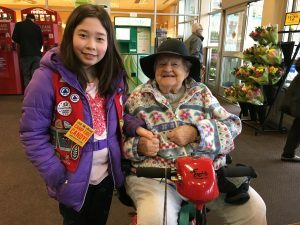 Those who work and volunteer at USO Northwest are the last US civilians that troops will come in contact with before they depart, and each troop will be given a box of Camp Fire candy as a token of appreciation. Businesses can support the sale by becoming a Merchant of Merit! Simply visit our online shop and purchase a case or more of yummy Creamy Smooth Mint Patties. All MOMs will receive special recognition in Camp Fire publications and a certificate of appreciation!